Is Apple Creating Ad-Supported Devices? It’s not often Apple investigates cost-cutting measures. Consider MP3 players. They existed long before the iPod, but Apple took the technology, put it in a great-looking box, doubled the price and had a world-wide hit. It’s the same story for the iPhone, iMacs, and the other technology Apple produces. Apple fanboys are rarely price-sensitive. When a new Apple product appears, they will sell their children for medical experiments just to get their hands on the device. However, a recently discovered Apple patent reveals the company are considering alternative revenue options. The patent refers to an “enforcement routine” which plays adverts at pre-defined intervals that the user would not be able to skip. In addition, the device may asks questions or request specific key-press combinations to ensure the user has been paying attention. An incorrect response could result in temporary device lockdown. Nasty. Although many would find such heavy-handed advertising intrusive, it would allow you to obtain an Apple product for a significantly discounted price — perhaps even free. There’s no certainty Apple will implement the technology. Like most major technology companies, they regularly submit patents which never result in an actual product. Apple have refused to comment further, however, unlike many previous filings, CEO Steve Jobs is named on this patent. Ad-supported revenue is an idea that’s been gaining momentum within the IT industry for several years. It’s Google’s primary source of income and Microsoft is trying it within products such as MS Works. For Apple, it could mark an extreme shift in emphasis away from selling premium hardware to dedicated disciples. If the advertising model works, anyone could have an Apple product and the perception of exclusivity would be lost forever. 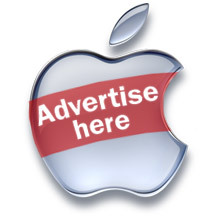 Could Apple be serious about the advertising patent? How would Apple users feel if their beloved products were available to the masses at little or no cost?